Domino is back! Launched just a few days ago, the new online format is part magazine part marketplace. Allowing readers to shop directly from their features, the magazine bypasses traditional and competitive forms of advertising. This strategy is viewed as new way of doing business for the magazine - one that will hopefully give the publication a second chance at life. For those of you not previously familiar with domino, it was a print magazine published by Conde Nast. Started in 2005, the magazine was published with wide praise until 2009 when it was shut down due to poor advertising revenues. Deborah Needleman was the founding editor in chief and ran the magazine for all four years of its circulation. 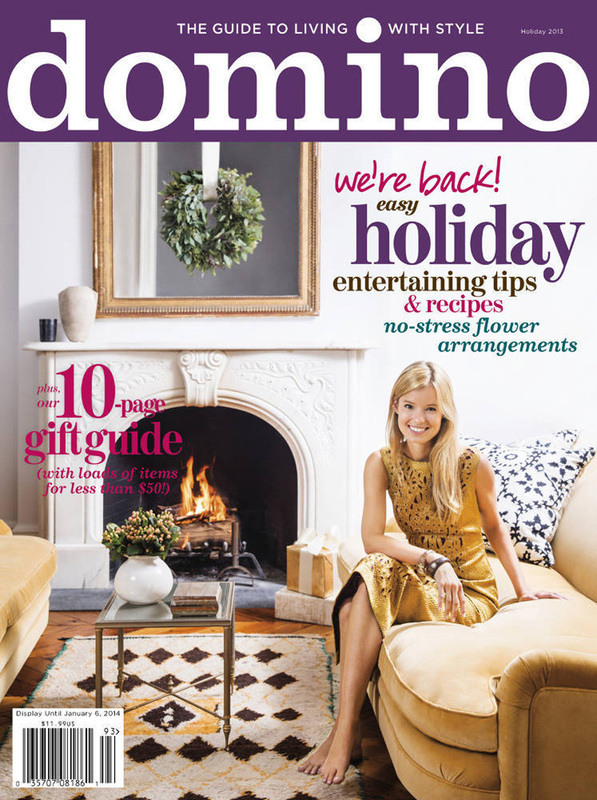 She along with Sara Ruffin Costello and Dara Caponigro also published domino: The Book of Decorating - a must own book for all home decorating enthusiasts. Needleman, who left Conde Nast when they closed domino, now is the editor and chief of T: The New York TImes Style Magazine. The "new" domino is now being run by Michelle Adams. Adams was the original co-founder of Lonny who parted ways with the online magazine in March of this year. The magazine will publish four issues a year - available online or in print by special order. In addition, they will be building a digital archive of past domino issues. With three ways to view each story (read story, view photos or shop the story) the format is user and pinterest friendly. However, when I tried to read the cover story of the current issue I got an error message so there still seems to be some kinks to work out. Needless to say, I am very excited about a new-ish design publication becoming available and will definitely be following along. I am feeling rather under the weather today and don't think I can muster a full post. So I am going to save the last installment of A Distinctive Home for Monday and instead will direct you all over to Lonny as the new September issue just came out. Enjoy!